The British and Irish Lions will open their 2013 tour with a game in Hong Kong before nine matches in Australia. The Lions will play three Tests - in Brisbane on 22 June, Melbourne on 29 June and Sydney on 6 July. The tourists will also play all five Aussie Super 15 sides, as well as a New South Wales-Queensland Country team. They will start the trip with an extra match, against the Barbarians in Hong Kong on 1 June, on their way to Australia, where they lost 2-1 in 2001. "The Lions receive numerous requests to play matches around the world outside of the traditional tour destinations of Australia, New Zealand and South Africa," said Lions tour manager Andy Irvine, the former Scotland and Lions full-back. "For 2013 we had the perfect opportunity to play a match in the developing rugby region of Asia, while at the same time break the long journey from Europe to Australia. As has become customary we also wanted 10 matches to maximise the essential pre-Test series build up." The Australian tour begins on Wednesday 5 June with a match against Super 15 franchise Western Force in Perth. The tourists will also face Queensland Reds in Brisbane on 8 June, the New South Wales Waratahs in Sydney on 15 June, ACT Brumbies in Canberra on 18 June and the Melbourne Rebels in Melbourne on 25 June. The Lions last toured Australia in 2001, the Wallabies winning a hard-fought series 2-1 after the tourists had won the opening Test - featuring a memorable try from Brian O'Driscoll - in Brisbane. "A Lions Tour is a massive occasion," said Australian Rugby Union managing director John O'Neill. "Behind the World Cup, it is the most high-profile, popular event our game can showcase. 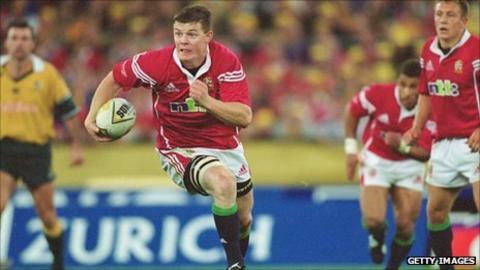 "The Lions tour here in 2001 was an extraordinary event and one that provided significant economic benefit to those cities that hosted major matches. "More than 8,000 Lions supporters came to Australia from the UK and Ireland on official tour packages and many more thousands made their own way here. "Two years ago in South Africa, there were said to be 40,000 Lions fans that made the trek there to support their team." After a 3-0 series battering in New Zealand in 2005, the Lions restored pride in South Africa two years ago. The hosts survived a thrilling Lions fightback to win the opening Test, before prevailing in an epic second Test, won with the last kick of the game. The Lions got the victory their efforts deserved in the third and final Test in Johannesburg. It was their first Test victory since the opening Test in Australia in 2001. The Lions won their previous series prior to that in Australia in 1989, recovering from a first Test loss to prevail 2-1. "It has to be said that the last two series between the Wallabies and the British & Irish Lions have been memorable," said Lions chairman Gerald Davies, the former Wales wing who was manager of the last tour to South Africa in 2009. "In 1989 and 2001 both three-Test series went down to the last match. I am sure that the 2013 series will be just as competitive with the tour reigniting the fierce but respectful rivalry that exists between the two sides." Overall the Lions have won 15 of their 20 Tests in Australia stretching back to 1904, with other visits in 1930, 1950, 1959 and 1966.